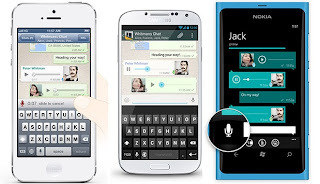 ilulz Blog: Whatsapp new update brings the voice messaging into your hands! 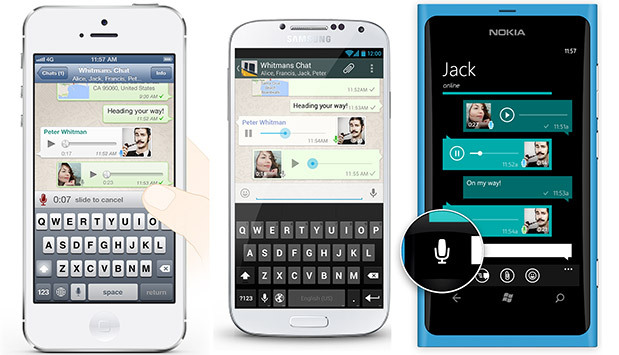 Whatsapp new update brings the voice messaging into your hands! Whatsapp announced that it has now hit the 300 million monthly active users mark, and also has announced enabling users to send voice notes to other Whatsapp users. This means you will be able to send a voice message to your friend on Whatsapp without the necessity of calling them. I don't see how this feature is great, but I know it's a good one specially for drivers who like to text while driving "Ahm, which is totally me." But I prefer the other Mic placed in the keyboard, where it allows you to talk and translate your voice into words. The company has started rolling out the voice messaging feature for its apps on Anroid, iPhone, BlackBerry, Windows Phone and Nokia.